A hallmark feature of cystic fibrosis (CF) is progressive pulmonary obstruction arising from exaggerated host proinflammatory responses to chronic bacterial airway colonization. The mechanisms for these heightened inflammatory responses have been only partially characterized, hampering development of effective anti-inflammatory therapies. 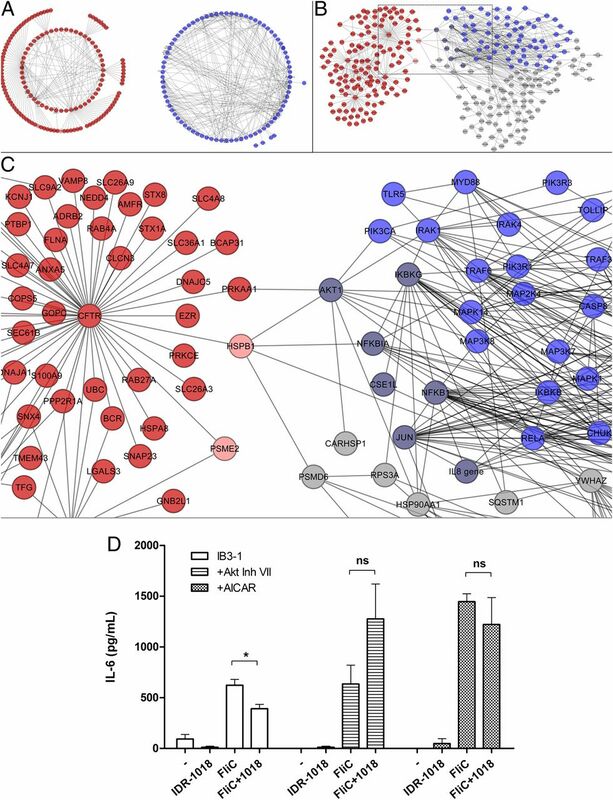 The aim of this study was to identify and validate novel dysfunctional processes or pathways driving the hyperinflammatory phenotype of CF cells using systems biology and network analysis to examine transcriptional changes induced by innate defense regulator (IDR)-1018, an anti-inflammatory peptide. 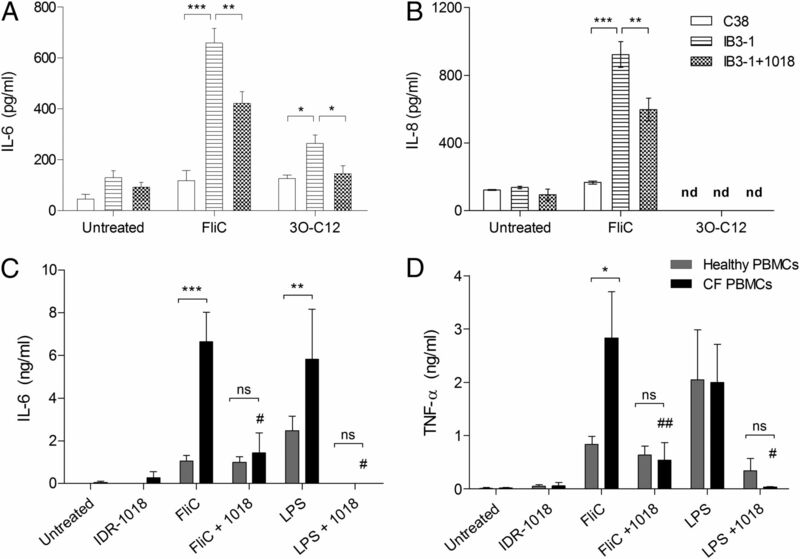 IDR-1018 selectively attenuated hyperinflammatory cytokine production from CF airway cells and PBMCs stimulated with multiple bacterial ligands, including flagellin (FliC). Network analysis of CF cell transcriptional responses to FliC and IDR-1018 identified dysfunctional autophagy as the target of the peptide via modulation of upstream adenosine monophosphate–activated protein kinase (AMPK)–Akt signaling. After treatment with FliC, CF cells were found to have elevated levels of the autophagosome marker LC3-II, and GFP-LC3–transfected CF airway cells showed abnormal perinuclear accumulation of GFP+ structures. In both instances, treatment of CF cells with IDR-1018 abolished the accumulation of LC3 induced by FliC. Furthermore, inhibition of autophagosome–lysosome fusion with bafilomycinA1 attenuated the anti-inflammatory and autophagosome-clearing effects of IDR-1018, as did a chemical inhibitor of Akt and an activator of AMPK. These findings were consistent with hypotheses generated in silico, demonstrating the utility of systems biology and network analysis approaches for providing pathway-level insights into CF-associated inflammation. Collectively, these data suggest that dysfunctional autophagosome clearance contributes to heightened inflammatory responses from CF transmembrane receptor mutant cells and highlight autophagy and AMPK–Akt signaling as novel anti-inflammatory targets in CF. Cystic fibrosis (CF) is caused by mutations in the CFTR gene encoding the CF transmembrane receptor (CFTR), an anion channel highly distributed in glandular tissue (1). In the airways, the classic CF phenotype is characterized by the accumulation of thickened mucus and predisposition to bacterial colonization of the lower respiratory tract. Colonization of the CF lung by Pseudomonas aeruginosa and other pathogens induces robust and sustained neutrophil-mediated inflammation that is disproportionately exaggerated relative to the bacterial load (2). Although there is debate over whether inflammation in the CF lung is primary (i.e., caused by CFTR mutations) or secondary to chronic infection (3, 4), inflammation remains the single most significant contributor to disease progression, and its control is crucial for improving patient outcomes (5). We and others have reported a heightened production of proinflammatory cytokines from CF cells exposed to innate immune-activating ligands from P. aeruginosa using a variety of models ranging from CF mutant cell lines to primary cells from patients including PBMCs (6–10). These findings have been recapitulated in conventional wild-type cells in which the knockdown of functional CFTR or expression of mutated CFTR confers the same phenotype, with a corresponding dysregulation of a variety of intracellular signaling pathways, including NF-κB (11, 12). Even with the implication of canonical immune signaling pathways in the heightened inflammatory responses of CF cells to innate immune activation, the mechanism(s) by which misfolded or absent CFTR gives rise to this phenotype are unclear. Autophagy is a cellular process that maintains homeostasis in response to multiple cell stressors, including endoplasmic reticulum (ER) stress. Autophagy is known to target misfolded ΔF508 CFTR from the ER to autophagosomes for degradation, preventing its accumulation (13). Activation of ER stress pathways by oxidative stress and misfolded CFTR accumulation correlates with inflammation in CF (14, 15). Autophagy has recently been identified as dysfunctional in CF (16–18), which might lead to heightened activation of ER stress pathways with inflammatory consequences (19); however, a direct link between autophagy and inflammation in CF has not yet been established. We have previously reported the development of a new class of anti-infective, anti-inflammatory peptides termed innate defense regulators (IDRs), based on endogenous host defense peptides such as LL-37 (20, 21). IDRs selectively enhance leukocyte recruitment to infection sites while selectively suppressing proinflammatory cell responses, limiting harmful consequences of an enhanced innate immune response. Second-generation peptides such as IDR-1018 have been developed to have enhanced anti-inflammatory activities in vivo that are decoupled from their anti-infective properties (22, 23). These immunomodulatory effects are mediated in part through the PI3K/Akt signaling pathway and the intracellular IDR receptor sequestosome-1 (p62), leading to downstream modulation of MAPK, NF-κB, and type I IFN pathways (20, 21, 23, 24). Network analysis is a computational approach that facilitates the study of complex systems by visualizing functional interactions between components. When applied to transcriptional datasets, the relationships between genes that comprise disease-specific transcriptional signatures can be visualized and used to identify novel disease processes (25). As a complex and interconnected system (>1500 individual components), innate immunity is well suited for study using network analysis (26, 27), and insights into the mechanisms of immunomodulation by both endogenous and IDR peptides have largely been obtained using these techniques (20, 23, 24, 28). On this basis, computational network biology methods were used in this study to generate testable hypotheses for mechanisms underlying the anti-inflammatory action of these peptides on CF cells. In doing so, we aimed to identify dysfunctional cellular pathways and/or processes contributing to disproportionate inflammation in CF, as these pathways could be the target(s) of IDR-1018 and future anti-inflammatory agents. 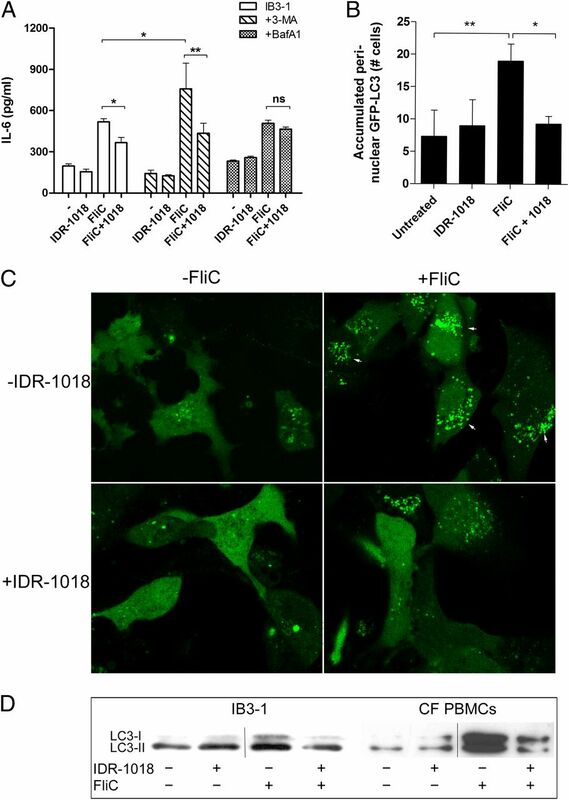 In this study, we report that IDR-1018 inhibited the exaggerated inflammatory responses of CF cells to multiple innate immune activators from P. aeruginosa. Network-level analysis of cell transcriptional responses to flagellin (FliC) predicted that the heightened inflammatory responses of CF cells arose in part due to dysfunctional autophagy. This prediction was confirmed in vitro with the observation that CF cells accumulate autophagosomes in response to the TLR5 agonist FliC, and IDR-1018 corrected their exaggerated inflammatory cytokine production to near-normal levels by promoting normal autophagosome clearance. These findings suggest that therapies that target the autophagy process might help alleviate lung inflammation in CF and further highlight the utility of systems-level computational approaches for making novel inferences into human diseases. Ultrapure recombinant FliC and N-3-oxo-dodecanoyl-L-homoserine lactone (3O-C12) were obtained from Invivogen (San Diego, CA) and Cayman Chemical (Ann Arbor, MI), respectively. LPS was isolated from P. aeruginosa as previously described (29). Peptide IDR-1018 (VRLIVAVRIWRR-NH2) was synthesized using solid-phase Fmoc chemistry as previously described (22). AKT Inhibitor VII, rapamycin, and bafilomycin A1 (BafA1) were obtained from EMD Chemicals (Gibbstown, NJ) and used at 50, 0.5, and 100 μM, respectively. 5-Aminoimidazole-4-carboxamide-1-beta-D-ribofuranoside (AICAR) and 3-methyladenine (3-MA) were obtained from Sigma-Aldrich (Oakville, ON, Canada) and used at 1 and 15 mM, respectively. Commercial kits were used according to the manufacturer’s instructions. Blood donors were patients of the pediatric CF clinic at the BC Children’s Hospital (Vancouver, BC, Canada). Inclusion criteria for donors were: ages 3–17 y, a clinical diagnosis of CF confirmed by genotyping, heterozygous or homozygous for the CFTR ΔF508 allele, and clinically stable on the day of blood collection (determined by physician assessment and, if indicated, by airway spirometry, sputum microbiology, and/or chest x-ray). Donors were excluded if they had used corticosteroids or immunosuppressants in the preceding 3 mo or were hospitalized in the preceding 8 wk. The ages and genotypes of the study participants and a description of how their cells were used are provided in Table I. This study used the well-characterized CF lung epithelial cell line IB3-1 (compound heterozygote for the ΔF508 and W1282X CFTR mutations) and the isogenic, CFTR-corrected C38 cell line (30). IB3-1 and C38 were grown in Primaria flasks (BD Biosciences, Mississauga, ON, Canada) in LHC-8 basal medium supplemented with 10% (v/v) FCS, 2 mM L-glutamine, 1 mM sodium pyruvate, and 1% penicillin–streptomycin–amphotericin B solution (all components from Invitrogen, Carlsbad, CA). Airway cells were seeded at a density of 2.5 × 105 cells/ml and allowed to grow for 16–20 h until confluent before cell stimulation experiments, as previously described (10). Blood was obtained from pediatric CF patients (n = 9) or healthy donors (n = 8) after obtaining informed consent/assent in accordance with University of British Columbia ethics approval. PBMCs were isolated by Ficoll-Paque PLUS (GE Amersham, Mississauga, ON, Canada) density centrifugation and seeded at 2 × 106 cells/ml in RPMI 1640 containing 10% heat-inactivated FCS, 2 mM L-glutamine, and 1 mM sodium pyruvate (all components from Invitrogen) as previously described (7, 21). PBMCs were allowed to rest for 1 h before use in cell-stimulation experiments. Airway cells and PBMCs were treated with FliC (1 μg/ml or 250 ng/ml, respectively), 3O-C12 (75 μM), or LPS (10 ng/ml) ± IDR-1018 (20 μg/ml). Chemical inhibitors were added 1 h prior to cell stimulations where indicated. Airway and PBMC cells were lysed after 3 and 4 h, respectively, posttreatment for RNA isolation or at 24 h for protein isolation and ELISA. Total RNA from cell lysates was isolated using the RNeasy Plus Mini Kit (Qiagen, Toronto, ON, Canada) and transcribed to cDNA with oligo(dT) primers (High-Capacity cDNA-RT Kit; Applied Biosystems, Foster City, CA). RNA quality was determined using a Bioanalyzer 2100 (Agilent Technologies, Mississauga, ON, Canada). mRNA was amplified using the RNA ampULSe kit (Kreatech, Durham, NC) according to the manufacturer’s instructions. Amplified cRNA was hybridized to human HT-12 expression bead chips (Illumina, San Diego, CA), and raw data were processed by the Prostate Centre Microarray Facility (Vancouver, BC, Canada) using Illumina BeadStudio version 3.4.0 (Illumina) to produce summary gene expression values. Subsequent data processing was carried out using the software Bioconductor in the R statistical language. Microarray values were normalized using quantile normalization (31) with the Beadarray software package, and p values were adjusted for multiple comparisons using the Benjamini-Hochberg method (32). Gene ontology (GO; http://geneontology.org) overrepresentation analysis was carried out using GOstats (33). Microarray data were deposited to the publically viewable National Center for Biotechnology Information Gene Expression Omnibus (accession number GSE35391; http://www.ncbi.nlm.nih.gov/geo/). Total RNA was isolated from PBMCs using the RNeasy Kit (Qiagen) from the first five CF patients enrolled in the study. RNA quality was determined as described above, and 500 ng total RNA was used for cDNA library preparation, according to the Illumina TruSeq RNA sample preparation guide (Illumina). As a final step, cDNA enrichment was carried out by 15-cycle PCR. Following quantification, 8 pM dsDNA was used for cluster generation on a CBOT instrument (Illumina). RNA sequencing was done on a GAIIx instrument (Illumina), performed as a single-read run with 50 amplification cycles. Data processing was carried out using CASAVA to convert raw data and demultiplex to FASTQ sequence files. Reads were aligned to the genome using TOPHAT (34) and then mapped to genes using GenomicFeatures (Bioconductor Core package). Differential gene expression (fold-changes and p values) and GO ORA were calculated using the Bioconductor packages edgeR (35) and GOsEquation (36), respectively. RNASeq transcriptional data were deposited to the National Center for Biotechnology Information’s Gene Expression Omnibus (accession number GSE35394) http://www.ncbi.nlm.nih.gov/geo/. Networks graphs were generated and analyzed as previously described (10, 23). Differentially expressed (DE) genes between sample groups were defined as having fold changes of ≥1.5 or ≤−1.5, with an associated p value ≤0.05. DE genes from the datasets were uploaded separately into InnateDB (37) to generate a list of protein–protein interactions between genes in the dataset and with first-order non-DE proteins with curated experimental evidence of an interaction. To analyze the complex functional relationships between genes comprising the observed transcriptional signatures, dysregulated genes were viewed as nodes in a network (network analysis), connected to one another by their protein-level interactions (25–27, 38), as previously described (10, 23, 28, 39, 40). In an initial analysis, CFTR and TLR5 interaction data were visualized using Cytoscape 2.8.0 for Windows (41) and then subsequently merged with a network graph of interactions between DE genes obtained from the epithelial cell microarray datasets. Autophagy-focused subnetwork analysis was carried out by merging first-order interaction networks with DE genes with the recently curated human autophagy interactome using the jActive plugin for Cytoscape, with significance defined as a Z-score >3.0, consistent with well-established protocols (42). Highly interconnected gene nodes within these pathways termed “hubs” represented key molecules involved in signal trafficking/mechanism, and these were determined using the software plugin cytoHubba for Cytoscape (43). In a separate analysis, subnetworks were identified mathematically based on network scoring algorithms that combined gene significance, hub degree, and betweenness centrality scores into a single total network score. This scoring was calculated in an unbiased fashion by using the BioNet Bioconductor software package to generate networks (44), according to the software’s documentation, with incorporated protein-level interaction data from Pathway Commons (45) and InnateDB. Gene nodes with net positive total network scores were included within the subnetwork and visualized using Cytoscape as described above. Cytokines in cell-free supernatants were quantified by ELISA. Matched capture and detection Ab pairs for TNF-α, IL-6, IL-8, IL-10, and CCL-2 were obtained from eBioscience (San Diego, CA), whereas IL-24 was obtained from R&D Systems (Minneapolis, MN). The pEGFP-LC3 vector (46) was a generous gift from Dr. T. Yoshimori (Osaka, Japan). IB3-1 cells were grown in eight-well μ-Slides (Ibidi) (8), transfected with 0.5 μg plasmid/well using Turbofect (Fermentas, Burlington, ON, Canada), incubated for 24 h, and stimulated as described above. Cells were directly visualized with an Olympus FV1000 microscope (Olympus), using 488/520 nm at constant voltage, corrected for background autofluorescence. Autophagosome accumulation was quantified by visually counting 65 GFP+ cells in each well to obtain the number with >10 GFP+ structures. Preparation of cell lysates, SDS-PAGE, and Western blots was done as previously described (28) using rabbit monoclonal anti-LC3 (New England Biolabs/Cell Signaling Technology, Pickering, ON, Canada). Total protein in each lysate was quantified by fluorimetry using the Qubit 2.0 Fluorometer (Invitrogen) and Qubit Protein Assay Kit (Invitrogen). Sample loading was controlled by equalizing protein among all lanes on each gel. Statistical differences were determined using GraphPad Prism 6.0 (GraphPad) using two-way ANOVA followed by Bonferroni’s post hoc for multiple conditions across two cell types, one-way ANOVA followed by Tukey’s post hoc for multiple conditions in a single cell type, or paired Student t tests for single comparisons in a single cell type. Initial studies on the anti-inflammatory effects of IDR-1018 were carried out using the well-studied CF airway cell line IB3-1 and C38 (CFTR-corrected). Cells were stimulated with innate immune activating molecules expressed by P. aeruginosa, namely FliC, and 3O-C12, as these ligands induce hyperinflammatory responses in CF cells (7, 9, 10). IB3-1 cells were found to secrete 2–5-fold more of the inflammatory cytokines IL-6 and IL-8 than stimulated C38 cells (Fig. 1A, 1B). When IB3-1 cells were pretreated by IDR-1018, these inflammatory responses were blunted by 30–50% (Fig. 1A, 1B). LPS was not used as a stimulus for these epithelial cells, as pilot studies showed only minimal cytokine induction. IDR-1018 attenuated the hyperinflammatory phenotype of CF cells. Airway epithelial cells pretreated with IDR-1018 were stimulated with bacterial ligands. Secreted IL-6 (A) and IL-8 (B) was measured after 24 h. Bars show the mean ± SEM of n = 3 experiments. PBMCs from CF donors (n = 5) or healthy controls (n = 8) were similarly treated, with production of IL-6 (C) and TNF-α (D) measured after 4 h. Bars show the mean ± SEM of individual patient responses. Statistically significant differences between healthy and CF cells are noted as *p < 0.05, **p < 0.01, ***p < 0.001. Statistically significant differences between CF PBMCs treated with or without IDR-1018 are noted as #p < 0.05, ##p < 0.01. nd, Not detected. We next sought to confirm the anti-inflammatory effect of IDR-1018 in primary, patient-derived cells. PBMCs were chosen for this purpose because: 1) they express a full repertoire of TLRs and produce a greater variety of cytokines than airway cells (47); (2) responses from freshly isolated PBMCs are less likely to be artifacts associated with long-term ex vivo culture or immortalization of CF airway cells (48, 49); 3) PBMCs express functional CFTR and recapitulate the CF-associated hyperinflammatory phenotype (7, 50); and 4) this PBMC phenotype is relevant in vivo, leading to impaired resolution of inflammation in CF (51). In addition, blood collection is significantly less invasive than bronchoscopy or bronchoalveolar lavage, thereby minimizing harm to the pediatric study population. Stimulated PBMCs from CF donors (Table I) produced 3–6-fold more of the inflammatory cytokines IL-6 and TNF-α when compared with cells from healthy donors (Fig. 1C, 1D), with the exception of LPS-induced TNF-α. The anti-inflammatory effect of IDR-1018 on CF PBMCs was substantial; exaggerated IL-6 and TNF-α responses to FliC were corrected to the level produced by control (non-CF) PBMCs, and LPS-induced IL-6 and TNF-α was completely abolished (Fig. 1C, 1D). PBMCs were not stimulated with 3O-C12, as it did not induce cytokine production in pilot studies. To confirm that IDR-1018 was specifically attenuating inflammatory responses, the production of other noninflammatory cytokines and chemokines was examined (Supplemental Fig. 1). Production of IL-24 from stimulated IB3-1 cells (Supplemental Fig. 1A) or CCL-2, IL-10, and IL-24 from stimulated CF PBMCs (Supplemental Fig. 1B–D) was either enhanced or unaffected by IDR-1018, indicating that the peptide was not globally suppressing innate immune function in CF cells. Due to the complexity of innate immunity and inflammation (27), systems biology and network analysis approaches were used to provide new hypotheses into the exaggerated inflammatory responses of CF cells and the corrective action of IDR-1018. Initial microarray studies were carried out comparing the transcriptional responses of IB3-1 and C38 cells to treatment with FliC and/or IDR-1018. Although these bronchial epithelial cells had muted cytokine responses compared with CF PBMCs (Fig. 1), they were well suited for systems biology studies because: 1) their transcriptional responses are robust enough to allow inflammatory pathway identification (52); 2) IB3-1 transcriptional responses have been validated by others (53, 54); and 3) IB3-1 and C38 are isogenic, minimizing nonspecific donor effects on gene expression. Cells were stimulated with TLR5 agonist FliC, as it induced heightened cytokine production from both CF epithelial cells and PBMCs (Fig. 1), enabling more accurate downstream comparisons between cell types. As a first step in understanding the functional interrelationship of genes with altered expression levels in response to IDR-1018, GO overrepresentation analysis (reflecting the functional attributes of the dysregulated genes) was carried out. This revealed that GO terms related to proinflammatory processes and ER stress were significantly overexpressed in IB3-1 relative to C38 cells following FliC stimulation (Table II), but were not significant in cells treated with IDR-1018. The single most significant GO term normalized by IDR-1018 addition was “cellular response to glucose starvation,” an unexpected finding given that it is not traditionally associated with inflammation or innate immunity. Network analysis was next used to understand how transcriptional changes induced by IDR-1018 influenced the signaling pathways of CFTR and TLR5 by visualizing genes in these pathways as network nodes interconnected by their protein–protein interactions (37). The CFTR and TLR5 networks self-segregated into two distinct entities with no apparent connectivity (Fig. 2A). When, after treatment with FliC + IDR-1018, genes that were differentially expressed in IB3-1 relative to C38 were merged alongside these networks, two distinct points of interconnectivity between the CFTR and TLR5 pathways became apparent (Fig. 2B) through Akt (AKT1) connected separately to Hsp27 (HSPB1) and adenosine monophosphate–activated protein kinase (AMPK) (PRKAA1) (Fig. 2C). 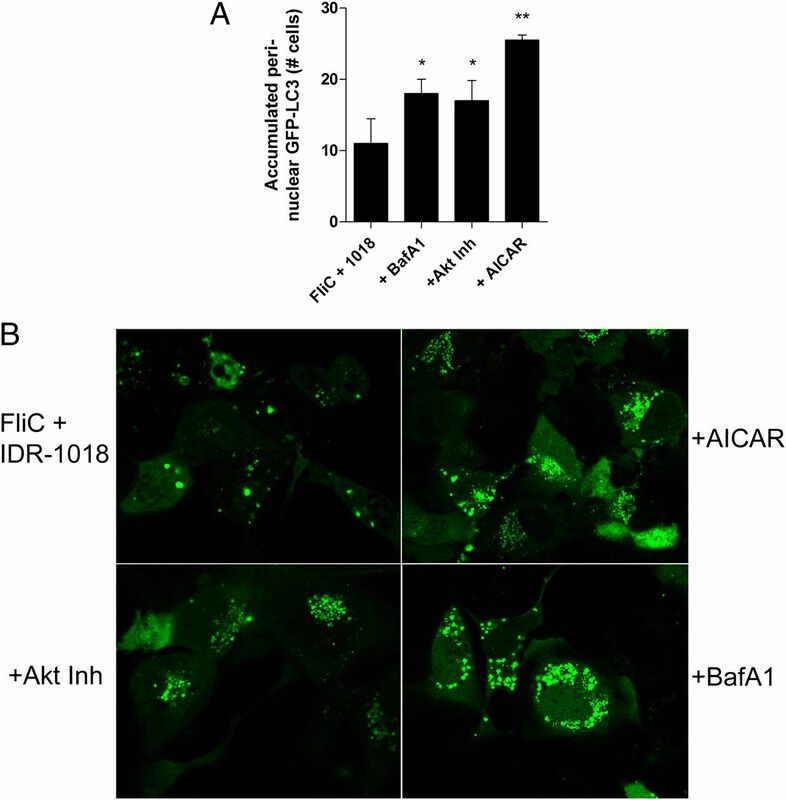 The in vitro functional relevance of these newly identified interconnections was confirmed by demonstrating that IDR-1018 no longer attenuated inflammatory responses from IB3-1 cells pretreated with AICAR (AMPK activator) or an Akt inhibitor (Fig. 2D). AMPK and Akt link CFTR and TLR5 to mediate the anti-inflammatory effect of IDR-1018 in CF airway cells. (A) Network analysis showing that CFTR and TLR5 signaling networks are independent and lack interconnectivity. (B) When genes DE following treatment with FliC + IDR-1018 were merged into (A), CFTR and TLR5 networks became connected (C) via PRKAA1 (AMPK), HSPB1 (Hsp27), and AKT1 (Akt). Genes in the CFTR and TLR5 networks are colored red and blue, respectively. If expression was affected by IDR-1018, nodes are colored pink (CFTR network), purple (TLR5 network), or gray (neither network). (D) IB3-1 cells were pretreated with an AKT inhibitor or AICAR, followed by FliC ± IDR-1018, and secretion of IL-6 was measured. Bars show the mean ± SEM of three independent experiments, with significance denoted as *p < 0.05. To further interrogate transcriptional processes driving heightened inflammatory responses in IB3-1 cells, a subset of 54 genes were mathematically determined as comprising a discrete, prominent, and statistically significant subdivision (subnetwork) within the larger interaction network (Supplemental Fig. 2). GO overrepresentation analysis on these 54 genes revealed terms related to vesicle transport, vesicle fusion, and autophagy as significantly dysregulated (Table III). This subnetwork was also found to contain multiple genes from the v-soluble N-ethylmaleimide–sensitive factor attachment protein receptor (SNARE) and syntaxin families, classically associated with the regulation of vesicle transport and fusion and Vps15 (PIK3R4), which is involved in autophagy induction. To validate these findings using patient cells, analyses were repeated on the transcriptional responses of CF PBMCs to FliC and IDR-1018. GO overrepresentation analysis revealed that terms associated with control of glucose responses, autophagy, and the regulation or propagation of inflammatory processes were similarly dysregulated in FliC-treated CF PBMCs, but no longer significant in the presence of IDR-1018 (Table IV). As autophagy-related themes were identified by these analyses in both CF airway cells and PBMCs, the role played by autophagy in the transcriptional responses to FliC and IDR-1018 was investigated in both cell types. First-order interaction networks were generated for DE genes in IB3-1 (relative to C38) and for CF PBMCs and merged with a curated autophagy interactome (55). This approach facilitated the identification of core subnetworks containing 128 nodes from IB3-1 transcriptional responses (Supplemental Fig. 3) and 145 nodes from CF PBMC transcriptional responses (Supplemental Fig. 4). Subnetworks from both cell types were found to contain a large proportion of DE genes curated in the autophagy interactome, with IDR-1018 altering the expression of >50% of the autophagy-related genes in both networks (Table V). Based on these data and analyses, we hypothesized that defective autophagy was driving heightened CF cell inflammatory responses and that IDR-1018 was limiting this phenotype by modulating autophagy. To test this hypothesis, two widely used autophagy modulators (56) were examined for effects on cytokine production by IB3-1 cells. 3-MA, which inhibits PIK3R4 (Supplemental Fig. 2), thereby blocking autophagosome formation, significantly increased IL-6 secretion by FliC-treated IB3-1 cells (Fig. 3A). When cells were pretreated with BafA1, which prevents autophagosome degradation by blocking fusion with lysosomes, the anti-inflammatory effect of IDR-1018 was abolished (Fig. 3A). In contrast, the autophagy inducer rapamycin did not significantly alter inflammatory cytokine responses elicited by FliC or their attenuation by IDR-1018 in IB3-1 cells (data not shown), consistent with a recent study (16). Dysfunctional autophagy in CF cells contributes to inflammation and is targeted by IDR-1018. IB3-1 cells were pretreated with 3-MA or BafA1 followed by FliC ± IDR-1018, and IL-6 was measured after 24 h (A). Bars show mean ± SEM of n = 3 experiments. (B) IB3-1 cells transfected with a GFP-LC3 plasmid were stimulated by FliC ± IDR-1018 for 24 h and GFP+ cells with perinuclear LC3 accumulation were counted. (C) Visualization of perinuclear LC3 accumulation (arrows) in cells by fluorescence microscopy. The dye used was GFP attached to LC3, read at 520 nm. Original magnification ×1000. Bars show mean counts ± SEM of GFP+ cells with perinuclear accumulation from n = 4 experiments, and slides are from one representative experiment. (D) Western blots showing native LC3-I and LC3-II expression in nontransfected IB3-1 and CF PBMCs. Loading was controlled by fluorometric protein quantification ensuring equal protein per lane. Blots are representative from n = 3 experiments (IB3-1) or n = 3 patients (PBMCs). Statistical significance indicated as *p < 0.05, **p < 0.01. Because BafA1 inhibited the anti-inflammatory properties of IDR-1018, we next examined the effect of IDR-1018 on autophagosome turnover in CF cells. GFP-LC3 transfection of IB3-1 before FliC treatment revealed significant numbers of cells containing large GFP-staining autophagosomes (Fig. 3B) with a pattern of perinuclear accumulation (Fig. 3C), a phenomenon observed when autophagosome maturation and fusion with lysosomes is impaired (57, 58). When cells were pretreated with IDR-1018, this increased perinuclear autophagosome accumulation was no longer observed (Fig. 3C). Activation of autophagy leads to cleavage of a marker protein LC3-I into the autophagosome membrane–bound LC3-II; however, LC3-II can also accumulate if autophagosome clearance is inhibited. FliC caused the accumulation of LC3-II in both IB3-1 cells and CF PBMCs, an effect that was attenuated by IDR-1018 (Fig. 3D), but only upon FliC addition. Because inhibition of Akt with inhibitor VII or activation of AMPK with AICAR blocked the anti-inflammatory effect of IDR-1018 (Fig. 2D), their effects on perinuclear autophagosome accumulation were examined. Both compounds prevented IDR-1018 from limiting autophagosome accumulation in FliC-treated IB3-1 cells, as did pretreatment with BafA1 (Fig. 4). Together, these data demonstrated that the dysfunctional autophagic responses of CF cells to bacterial ligands such as FliC contributed to their inflammatory phenotype. By restoring the ability of CF cells to clear autophagosomes in an AKT–AMPK-dependent manner, IDR-1018 was able to attenuate their inflammatory phenotype. Autophagosome clearance by IDR-1018 is mediated by AMPK–Akt. GFP-LC3–transfected IB3-1 cells were pretreated with an AKT inhibitor, AICAR or BafA1 followed by FliC ± IDR-1018. GFP+ cells with perinuclear LC3 accumulation were counted after 24 h (A), and perinuclear LC3 accumulation (arrows) was visualized by fluorescence microscopy (B). The dye used was GFP attached to LC3, read at 520 nm. Original magnification ×1000. Bars show mean counts ± SEM of GFP+ cells with perinuclear accumulation from n = 4 experiments, and images are from one representative experiment. Significance indicated as *p < 0.05, **p < 0.01. Lung inflammation continues as the major life-limiting disease feature of CF, but no cohesive model explains its origins. In this work, we report that: 1) exposure of CF cells to the TLR5 ligand FliC triggered abnormal inflammatory responses and autophagosome accumulation; and 2) rescue of autophagosome clearance in CF cells correlated with the correction of inflammatory cytokine production to near-normal levels. These findings highlight autophagy as mechanistically important in inflammation in CF. Both inflammation and the immunomodulatory mechanisms of IDRs (and the endogenous host defense peptide LL-37) are complex and involve several intracellular and extracellular targets, pathways, and effectors. This complexity has necessitated the use of computational systems biology approaches, which enable the generation of hypotheses for testing how these peptides function in model systems (20, 22, 23, 28). In this study, we have extended these methods to enable the stepwise generation and in vitro testing of hypotheses regarding CF-associated inflammation and the anti-inflammatory actions of IDR-1018 in CF cells. Microarrays have been used previously to study inflammation in CF in a classical, descriptive manner in which single DE genes are identified and subsequently confirmed using molecular approaches (53, 54, 59). Instead, this study employed systems-level analysis to identify important dysregulated pathways and processes that drive inflammation in CF cells, thereby increasing the power of the analysis by placing into context a multitude of single gene components that may participate in any number of interconnected or redundant pathways (27). By validating these findings at the pathway level instead of confirming individual pathway components, our approach enabled the identification of autophagy as a functionally relevant biological process in CF. Dysfunctional autophagy was recently identified in CF, with Luciani et al. (16) observing that autophagy triggers failed to upregulate this process in CF cells, whereas in contrast Bodas et al. (17) observed normal autophagy induction with aberrant perinuclear autophagosome accumulation. However, innate immune activating ligands were not used as stimuli in either study, limiting conclusions regarding inflammation because these ligands are required to induce the hyperinflammatory phenotype in CF patients, cells, and animal models (4, 7–10, 60–62). In another study (18), the induction of autophagy promoted clearance of Burkholderia cepacia by CF mouse macrophages, with decreased production of IL-6, although it was unclear if reduced inflammation was due to autophagy induction or decreased bacterial load (and thus decreased bacterial ligands). The current study therefore provides the strongest evidence that dysfunctional autophagy in CF cells gives rise to heightened inflammatory responses to bacterial ligands. It was observed that the hyperinflammatory phenotype elicited by the TLR5 ligand FliC correlated with the accumulation of perinuclear autophagosomes (Fig. 3). TLR stimulation can induce autophagy via canonical downstream kinases, but autophagy induction through TLR5 appears poor or nonexistent (63, 64). Therefore, it seemed likely that autophagosome accumulation and inflammatory responses from FliC treatment were more likely a result of impaired clearance of these structures rather than heightened autophagy induction. Consistent with this conclusion, the blocking of TLR-induced autophagy using the inhibitor 3-MA, in FliC-treated IB3-1 cells, synergistically enhanced proinflammatory IL-6 production (Fig. 3A), indicating that autophagy induction was anti-inflammatory. The formation of large autophagosomes in the perinuclear space is a normal part of their maturation, yet they are rarely LC3-positive, and cells with these structures lack corresponding increases in LC3-II protein (57, 58), in contrast to what was observed in this study in FliC-treated CF cells (Fig. 3). Furthermore, the autophagosome–lysosome fusion inhibitor BafA1 did not lead to additional increases in autophagosome accumulation or increased IL-6 production in FliC-treated cells, indicating that FliC was already maximally inhibiting fusion. BafA1 did, however, completely block both the anti-inflammatory and autophagosome-clearing effects of IDR-1018 (Figs. 3, 4). Collectively, these data indicate that dysregulated autophagosome–lysosome fusion and/or clearance was the autophagy step most relevant to heightened CF inflammatory responses and to IDR-1018 alleviation of hyperinflammation. Consistent with this, the human host–defense peptide LL-37, which is functionally related to the IDR peptides, was shown to induce autophagy and enhance autophagosome–lysosome fusion and clearance in non-CF situations (65). To link these events to inflammation, we propose a model in which ER stress, a known component of CF-associated inflammation (2, 14), acts as an intermediary between autophagosome accumulation and the inflammatory responses of CF cells (Fig. 5). We recently demonstrated that ER stress is elevated at baseline in a variety of CF tissues and cell types, causing activation of downstream pathways that synergize with canonical TLR5 signaling to induce exaggerated inflammatory responses to FliC (19). Given that ER stress promotes autophagy as a negative-feedback system to limit misfolded CFTR accumulation in the ER through autophagosome–lysosome-mediated degradation (13, 66), we propose that therapeutic interventions that promote normal autophagy in CF cells could potentially limit inflammation by reducing the burden of ER stress in CF cells. Overrepresentation analysis of gene expression indicated that ER stress was significantly dysregulated in IB3-1 after FliC treatment, but this did not occur in the presence of IDR-1018 (Table II). Furthermore, blockade of autophagy initiation with 3-MA, which would lead to further CFTR accumulation in the ER, induced proinflammatory responses to FliC (Fig. 3A), consistent with our recent observation that elevated ER stress is present in CF cells and tissues, and predisposed CF airway cells to exhibit hyperinflammatory responses to FliC (19). On this basis, we therefore propose that the specific disruption of autophagosome clearance by FliC in CF cells decreases their ability to deal with their ER stress burden by causing the system to back up, leading to activation of proinflammatory ER stress pathways that amplify subsequent TLR-elicited responses. Model: dysfunctional autophagosome clearance perpetuates inflammation in CF cells. 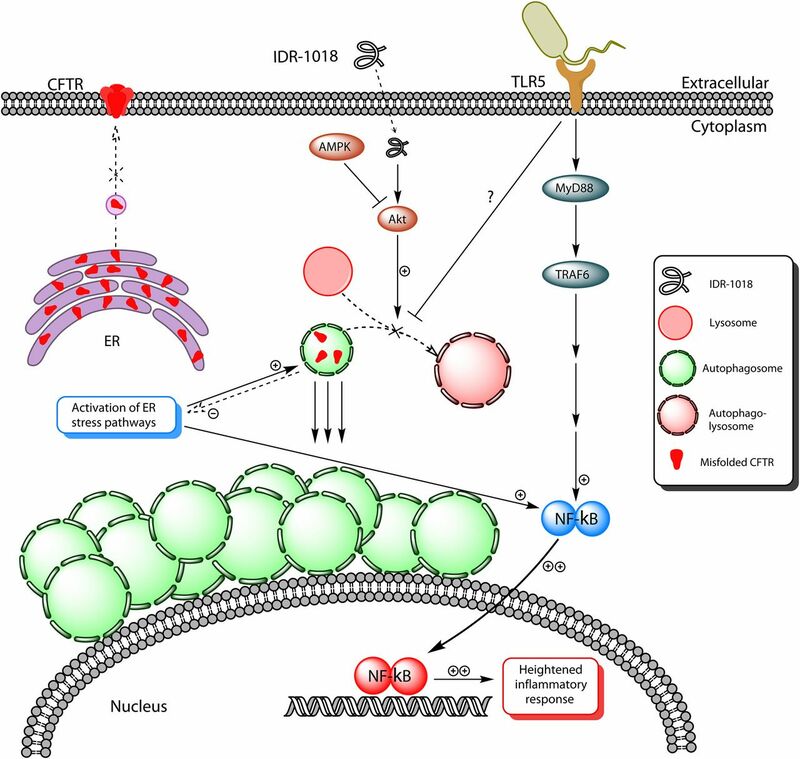 Based on the assembled evidence, it is proposed that misfolded CFTR ΔF508 accumulates in the ER, inducing ER stress and autophagy. Ligation of TLR5 by FliC interferes with autophagosome–lysosome fusion, leading to accumulation of autophagosomes and misfolded CFTR in the ER. ER and cell-stress pathways are further activated and synergize with canonical TLR activation of NF-κB to amplify the cell inflammatory responses. IDR-1018 interrupts this inflammatory amplification by restoring autophagosome clearance through an AMPK–Akt-dependent pathway. TRAF6, TNFR-associated factor 6. Network analysis of CF cell transcriptional responses identified two Akt-dependant pathways as potential mediators of IDR-1018 (Fig. 2). Although Akt and AMPK are known to modulate autophagy (55) and Akt mediates anti-inflammatory effects of IDR peptides (21), we report in this study that they bridge the CFTR and TLR5 pathways (Fig. 2). The CFTR and TLR5 pathways have not previously been linked through protein-level interactions (now shown in the InnateDB-generated plots in Fig. 2A). We focused on AMPK–Akt because the biological role of AMPK (55, 67) was most consistent with the overrepresented glucose responses and autophagy GO terms (Tables II, IV). These analyses were confirmed by the finding that either an AMPK activator or Akt inhibitor could attenuate the anti-inflammatory and autophagosome-clearing properties of IDR-1018 in CF cells (Figs. 2D, 4). As AMPK activation inhibits Akt signaling (67), these data are consistent with a model in which the effects of IDR-1018 are mediated by an Akt-dependent pathway that is negatively regulated by AMPK. Akt is known to crosstalk with the SNARE family proteins syntaxin-2, -4, and -7 and VAMP7/8 that regulate autophagosome–lysosome fusion (68–70), and these genes were among the highest scoring nodes in our subnetwork analyses (Supplemental Fig. 2). Similarly, p62 (SQSTM1) plays a critical role in autophagosome formation (56), contributes to dysfunctional autophagy in IB3-1 cells (16), and is an intracellular receptor for IDR peptides (24). SQSTM1 was consistently identified in every network analysis carried out on peptide-treated CF cells (Fig. 2, Supplemental Figs. 2–4). IDR-1018 might also influence autophagy more peripherally, for example, by increasing levels of the autophagy-inducing cytokine IL-24 (71) in both IB3-1 and CF PBMCs (Supplemental Fig. 1), because the production of IL-24 is normally defective in CF cells (59). Indeed, it seems possible that these separate pathways all contribute to the underlying autophagy dysfunction in CF and/or to autophagy induction/resolution by IDR peptides. Lung inflammation in CF patients is not exclusively induced by FliC and occurs following colonization by non-Pseudomonal pathogens that lack flagellin and therefore do not activate TLR5 (72). FliC was selected as a model stimulus for this work primarily because it was the one ligand that consistently induced hyperinflammatory responses from CF epithelial cells and PBMCs (Fig. 1). The use of this ligand is further justified by the knowledge that near-ubiquitous colonization of CF patients with P. aeruginosa occurs by adulthood and is a major predictor of mortality (73), that FliC is the major inflammation-provoking ligand from this bacterium (7, 9), and that a loss of function mutation in TLR5 is associated with better prognostic factors in CF patients (8). Still, it is quite possible that other inflammation-provoking bacterial ligands may similarly dysregulate autophagy in CF cells, and further studies on the broader interplay between innate immunity and autophagy in CF are warranted. In addition to predisposing CF patients to inflammation, dysfunctional autophagy may also play a role in the ability of CF-associated pathogens to colonize the respiratory tract. Staphylococcus aureus, an early colonizer of the CF lung, subverts functional autophagy to kill host cells (74). In the CF lung, dysfunctional autophagy could limit virulence of S. aureus, limiting immune activation by this organism, thereby enhancing its persistence. In the case of P. aeruginosa, autophagy is required for clearance of this organism by alveolar macrophages (75), and dysfunctional autophagy may therefore play a role in the near-ubiquitous colonization of CF patients by this organism. A further clinicopathological correlation between autophagy and bacterial lung colonization has been reported, with CF patients treated with the antibiotic and autophagy-blocking drug azithromycin becoming predisposed to infection with atypical Mycobacterium (76). In summary, we have shown that the TLR5 ligand FliC causes autophagosome accumulation in CF cells with inflammatory consequences. Using IDR-1018 as proof of principle, we demonstrated that rescuing the clearance of accumulated autophagosomes in CF cells corrected their exaggerated innate immune responses to bacterial ligands to near-normal levels. These insights were generated in an unbiased manner using computational systems biology methods, validating them at each step using CF cells. Although this work was predominantly carried out in CF epithelial cell lines with known limitations, similar observations were made in primary PBMCs from CF patients, thereby validating our findings and increasing their generalizability. This work highlights the utility of applying systems biology to understanding the nature of inflammation in human disease and identifies autophagy as a potentially druggable target in CF, with the aim of limiting inflammation-mediated pulmonary decline in afflicted individuals. IDR-1018 has been outlicensed to Elanco Animal Health (Greenfield, IN) for treating animal infections with patents assigned to R.E.W.H.’s employer, the University of British Columbia. Financial remunerations or royalties will not be received by R.E.W.H. from this licensing or this initiative. IDR-1018 will be developed by the Cystic Fibrosis Canada’s Translational Initiative as a potential treatment for hyperinflammation in cystic fibrosis. This initiative is a partnership among the University of British Columbia (academic), Centre for Drug Research and Development (nonprofit), and Cystic Fibrosis Canada (nonprofit charitable). These agreements are disclosed as apparent conflicts of interest rather than as real financial conflicts of interest. The other authors have no financial conflicts of interest. We thank A. Tang for technical assistance, Dr. M. Roberge (Vancouver, BC, Canada) for providing the GFP-LC3 plasmid, and all of the patients, their families, and the staff at the BC Children’s Hospital cystic fibrosis clinic. M.L.M. holds a Canadian Institutes of Health Research Doctoral Research Award. S.E.T. was supported by the Canadian Child Health Clinician Scientist Program, Cystic Fibrosis Canada, the BC Children’s Hospital Foundation, and the British Columbia Lung Association. R.E.W.H. received support from Cystic Fibrosis Canada and the Canadian Institutes of Health Research and is the recipient of a Canada Research Chair. The sequences presented in this article have been submitted to the National Center for Biotechnology Information’s Gene Expression Omnibus (http://www.ncbi.nlm.nih.gov/geo/) under accession numbers GSE35391 and GSE35394. soluble N-ethylmaleimide–sensitive factor attachment protein receptor.
. 2003. Cystic fibrosis. Lancet 361: 681–689. 2006. Innate immune response in CF airway epithelia: hyperinflammatory? Am. J. Physiol. Cell Physiol. 291: C218–C230.
. 2008. Anti-inflammatory therapies for cystic fibrosis-related lung disease. Clin. Rev. Allergy Immunol. 35: 135–153.
. 2005. NF-kappaB activation and sustained IL-8 gene expression in primary cultures of cystic fibrosis airway epithelial cells stimulated with Pseudomonas aeruginosa. Am. J. Physiol. Lung Cell. Mol. Physiol. 288: L471–L479.
. 2010. Proinflammatory phenotype and increased caveolin-1 in alveolar macrophages with silenced CFTR mRNA. PLoS ONE 5: e11004.
. 2009. ER-associated complexes (ERACs) containing aggregated cystic fibrosis transmembrane conductance regulator (CFTR) are degraded by autophagy. Eur. J. Cell Biol. 88: 215–226.
. 2011. Critical role of CFTR-dependent lipid rafts in cigarette smoke-induced lung epithelial injury. Am. J. Physiol. Lung Cell. Mol. Physiol. 300: L811–L820.
. 2011. Autophagy stimulation by rapamycin suppresses lung inflammation and infection by Burkholderia cenocepacia in a model of cystic fibrosis. Autophagy 7: 1359–1370.
. 2012. Atypical activation of the unfolded protein response in cystic fibrosis airway cells contributes to p38 MAPK-mediated innate immune responses. J. Immunol. 189: 5467–5475.
. 2010. Structural studies of a peptide with immune modulating and direct antimicrobial activity. Chem. Biol. 17: 970–980.
. 2012. Effective adjunctive therapy by an innate defense regulatory Peptide in a preclinical model of severe malaria. Sci. Transl. Med. 4: 135ra64.
. 2009. Systems biology of innate immunity. Immunol. Rev. 227: 264–282.
. 2009. Enabling a systems biology approach to immunology: focus on innate immunity. Trends Immunol. 30: 249–262.
. 2009. Systems biology evaluation of immune responses induced by human host defence peptide LL-37 in mononuclear cells. Mol. Biosyst. 5: 483–496.
. 1993. Expression of the cystic fibrosis transmembrane conductance regulator from a novel adeno-associated virus promoter. J. Biol. Chem. 268: 3781–3790.
. 1995. Controlling the false discovery rate: a practical and powerful approach to multiple testing. J. R. Statist. Soc.B 57: 289–300.
. 2010. edgeR: a Bioconductor package for differential expression analysis of digital gene expression data. Bioinformatics 26: 139–140.
. 2010. Gene ontology analysis for RNA-seq: accounting for selection bias. Genome Biol. 11: R14.
. 2008. Systems biology: an evolving approach in drug discovery and development. Drugs R D. 9: 203–216.
. 2011. Cytoscape 2.8: new features for data integration and network visualization. Bioinformatics 27: 431–432.
. 2007. Integration of biological networks and gene expression data using Cytoscape. Nat. Protoc. 2: 2366–2382.
. 2008. Hubba: hub objects analyzer—a framework of interactome hubs identification for network biology. Nucleic Acids Res. 36(Web Server issue): W438–W443.
. 2010. BioNet: an R-Package for the functional analysis of biological networks. Bioinformatics 26: 1129–1130.
. 2011. Pathway Commons, a web resource for biological pathway data. Nucleic Acids Res. 39(Database issue): D685–D690.
. 2000. LC3, a mammalian homologue of yeast Apg8p, is localized in autophagosome membranes after processing. EMBO J. 19: 5720–5728. 2009. Pseudomonas aeruginosa: can studies in engineered cells tell us why is it such a problem in people with cystic fibrosis? Focus on “Cystic fibrosis transmembrane conductance regulator and caveolin-1 regulate epithelial cell internalization of Pseudomonas aeruginosa”. Am. J. Physiol. Cell Physiol. 297: C235–C237.
. 2004. Interleukin 8 secretion from monocytes of subjects heterozygous for the deltaF508 cystic fibrosis transmembrane conductance regulator gene mutation is altered. Clin. Diagn. Lab. Immunol. 11: 819–824.
. 2012. Absence of the cystic fibrosis transmembrane regulator (Cftr) from myeloid-derived cells slows resolution of inflammation and infection. J. Leukoc. Biol. 92: 1111–1122.
. 2011. Differential global gene expression in cystic fibrosis nasal and bronchial epithelium. Genomics 98: 327–336.
. 2004. Gene expression profile analysis of 4-phenylbutyrate treatment of IB3-1 bronchial epithelial cell line demonstrates a major influence on heat-shock proteins. Physiol. Genomics 16: 204–211.
. 2001. Control of the proinflammatory state in cystic fibrosis lung epithelial cells by genes from the TNF-alphaR/NFkappaB pathway. Mol. Med. 7: 523–534.
. 2004. Role for Rab7 in maturation of late autophagic vacuoles. J. Cell Sci. 117: 4837–4848.
. 2005. Lysosomal turnover, but not a cellular level, of endogenous LC3 is a marker for autophagy. Autophagy 1: 84–91.
. 2009. New microbicidal functions of tracheal glands: defective anti-infectious response to Pseudomonas aeruginosa in cystic fibrosis. PLoS ONE 4: e5357.
. 2005. Cytokine levels in sputum of cystic fibrosis patients before and after antibiotic therapy. Pediatr. Pulmonol. 40: 15–21.
. 2006. Acute Pseudomonas challenge in cystic fibrosis mice causes prolonged nuclear factor-kappa B activation, cytokine secretion, and persistent lung inflammation. J. Allergy Clin. Immunol. 117: 1163–1169.
. 2008. MyD88 and Trif target Beclin 1 to trigger autophagy in macrophages. J. Biol. Chem. 283: 33175–33182.
. 2010. TRAF6 and A20 regulate lysine 63-linked ubiquitination of Beclin-1 to control TLR4-induced autophagy. Sci. Signal. 3: ra42.
. 2009. Vitamin D3 induces autophagy in human monocytes/macrophages via cathelicidin. Cell Host Microbe 6: 231–243.
. 2010. Regulation of mutual inhibitory activities between AMPK and Akt with quercetin in MCF-7 breast cancer cells. Oncol. Rep. 24: 1493–1497.
. 2008. Regulation of the endosomal SNARE protein syntaxin 7 by colony-stimulating factor 1 in macrophages. Mol. Cell. Biol. 28: 6149–6159.
. 2011. SNARE proteins are required for macroautophagy. Cell 146: 290–302.
. 2011. Autophagosome precursor maturation requires homotypic fusion. Cell 146: 303–317.
. 2010. OSU-03012 enhances Ad.7-induced GBM cell killing via ER stress and autophagy and by decreasing expression of mitochondrial protective proteins. Cancer Biol. Ther. 9: 526–536.
. 2011. Inflammatory responses to individual microorganisms in the lungs of children with cystic fibrosis. Clin. Infect. Dis. 53: 425–432.
. 2010. Determination of mortality from cystic fibrosis. Pneumologia 59: 170–173.
. 2007. Staphylococcus aureus subvert autophagy for induction of caspase-independent host cell death. J. Biol. Chem. 282: 2695–2706.
. 2011. Azithromycin blocks autophagy and may predispose cystic fibrosis patients to mycobacterial infection. J. Clin. Invest. 121: 3554–3563.